Schlock-Wire: Shout! Factory Brings Sci-Fi Hit SECTOR 7 From Korea To U.S. DVD & Blu-Ray – Schlockmania! This summer, brace yourself for non-stop action, suspense and edge-of-your-seat thrills as something unknown strikes terror into our hearts from 8,000 feet under the deep sea. On June 26, 2012, Shout! Factory, in collaboration with CJ E&M, will unleash Korea ’s first 3D sci-fi thriller SECTOR 7 on Blu-ray 3D™ and DVD, as well as being made available on digital entertainment platforms. SECTOR 7 Blu-ray 3D includes the movie in high-definition 3D and on high-definition 2D. Both Blu-ray 3D and DVD editions boast English and Korean audio tracks, English subtitles and insightful bonus content. A must have home entertainment collection for sci-fi horror movie fans, collectors and world cinema enthusiasts, SECTOR 7 Blu-ray 3D is priced to own at $29.97 SRP; the DVD has a suggested retail price of $19.99. Movie fans and collectors can pre-order SECTOR 7 now on Amazon before the Blu-ray 3D and DVD hit store shelves nationwide. 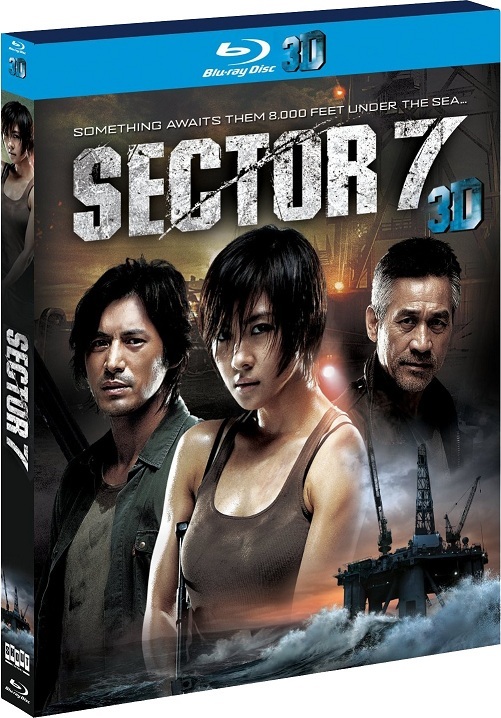 Starring popular international female action star Ha Ji-Won and directed by Kim Ji-Hoon, SECTOR 7 delivers blockbuster home entertainment, boasting fierce action, daring stunts and spectacular CG and 3D technology. Hae-jun (Ha Ji-Won) is working as a marine equipment manager on an old oil prospecting platform stationed at Sector 7, the mining area in the vast open sea located off the southern tip of Korea’s Jeju Island. One day, a new recruit sinks to the bottom of the sea. Evidence suggests that it was not an accident, and other crew members begin to turn up dead. The few survivors soon discover an underwater creature roaming the rig. The viral monster infiltrated the ship through the drilling pipe and has been feeding on crew members to survive. As Hae-jun and her remaining crew lose all communications to the outside world, a frantic fight for their lives begins. *Consumers will need to own either a 3D TV, 3D capable BD player and glasses to view full 3D capabilities. Special features are not rated, and are in standard definition and in 2D.